Every day, I reach an hour or two after bedtime and sigh to myself, If only I had finished this project and that blog post and all of those dishes. I don't know if I'll ever be able to completely convince myself that I should just accept that stay-at-home mommies cannot accomplish everything on their to-do lists - but I am really trying! So today, rather than making a list of all the things I wanted to do, I made a different sort of list. Here’s what I accomplished today, before Daddy came home from work. Real life mommy selfie. Who has time for makeup, anyway? -hug fest with my littles. We smothered each other in kisses and squeezes. -picked up my couch cushions at least eleven times. They’re a “Scooby super sandwich,” you see – so they end up all over the house. -rocked a baby who wouldn’t sleep (for over an hour). -re-organized half a bookshelf to keep the paper pages out of Addie’s reach. -read stories about Pooh, alligators, tractors, Curious George, and princesses. -made homemade spaghettios for lunch. -cleaned apple slices off the floor. -ran the cloth diaper laundry through 3 wash cycles and 3 dry cycles and hung the covers to dry. -washed two other loads of laundry. 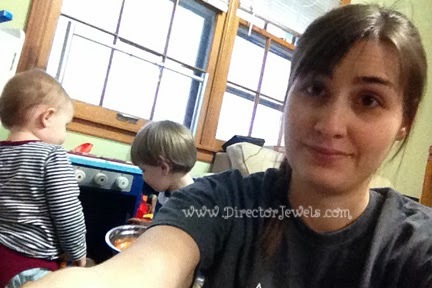 -had a Laurie Berkner/Imagination Movers dance party in the kitchen. -gathered a list of local bloggers for a PR contact I am working with for an upcoming project. -hand washed one of the twelve pans in my sink. -listed a diaper for sale on a Facebook buy/sell/trade page. -changed about 9 diapers, three pairs of pants, one pair of socks. -washed sticky hands and faces several times. -rescued Mr. Potato Head pieces from someone’s mouth. -condensed an album of over 200 photos to under 50 for a blog post. -ran around the house pretending to be an airplane. -read “There’s a Wocket in My Pocket” eight times. -packaged and printed a shipping label for an (incredibly late) Christmas gift for my nephew. -left an enormous pile of papers and books from the bookshelf on the kitchen table, so there is pretty much nowhere to eat dinner. Which, no, was not prepared when Daddy came home. If I just wrote "be a mommy" at the top of my to-do list every day, I would definitely be able to cross off a big item at the end of each night. Even if I (gasp!) went to bed at a reasonable hour. What did you accomplish today that wasn't on your list? I spontaneously cleaned the living room and am planning on tackling the kitchen soon! Sometimes I just wonder why we even try since the kids destroy everything again in minutes (or seconds...). Cleaning really does seem so pointless most of the time! LOL! I think you forgot to add that this was everything you did in the first hour of your day. I absolutely LOVE this list! Too often we let ourselves feel like we haven't accomplished anything, when we've really been doing SO, SO MUCH. It's really true! A lot is accomplished if we do nothing but hold babies all day, right? Some days my husband comes home and asks what we did and I have to think. Maybe I should keep a list - it really is amazing what we all get done in a day, even though it may not feel like it when we look at our "to-do list". Great post!